Using the Mini USB cable that came with your board, connect your BeagleBone to your computer. 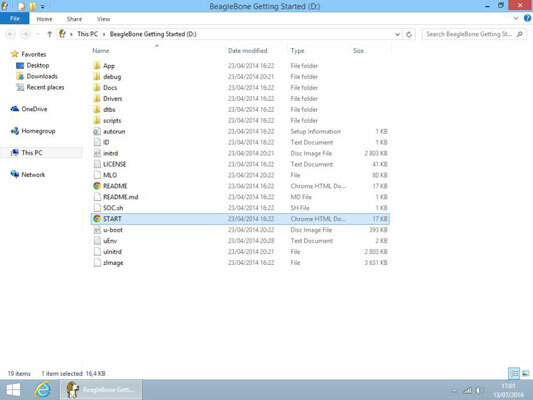 After a few seconds, a drive called BeagleBone Getting Started should appear in your computer’s file system. Your BeagleBone comes with everything you need to get started: the drivers for its setup, as well as documentation and project examples. 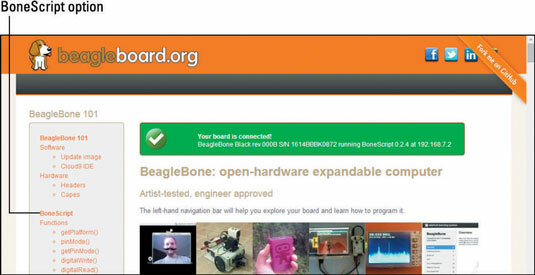 Go to your file system, and double-click the BeagleBone Getting Started disk. Open the file called START.htm in your default web browser. With the file you just opened on your web browser, click Step 2: Install Drivers in the menu on the left side of the web page. Use the appropriate installation method based on your OS (Windows or Mac OS X). If you’re using Linux, it isn’t necessary to install the drivers. Windows: If you’re using Windows, we recommend that you try to install the drivers for the 64-bit version. If that installation fails, you’re running a 32-bit version, so install the 32-bit drivers. Doing things this way guarantees that you won’t install 32-bit drivers on a 64-bit machine. Macintosh: In Mac OS X, you have to install the network and serial drivers. This process is very straightforward. After you open each driver file, you click the Next button until the installation is finished. After your drivers are installed, you need to open an URL on your web browser. Enter 192.168.7.2 in the address bar. If everything is working properly, you should see a green box at the top of the screen that says Your board is connected!